Westbury Arts Centre have now appointed a textile artist and a group of dancers/choreographers to work with the community on an exciting piece of performance art for Great War MK. Working with schools, community groups and individuals across the city the aim is to create a dynamic piece of work that could be displayed in Middleton Hall or Campbell Park. 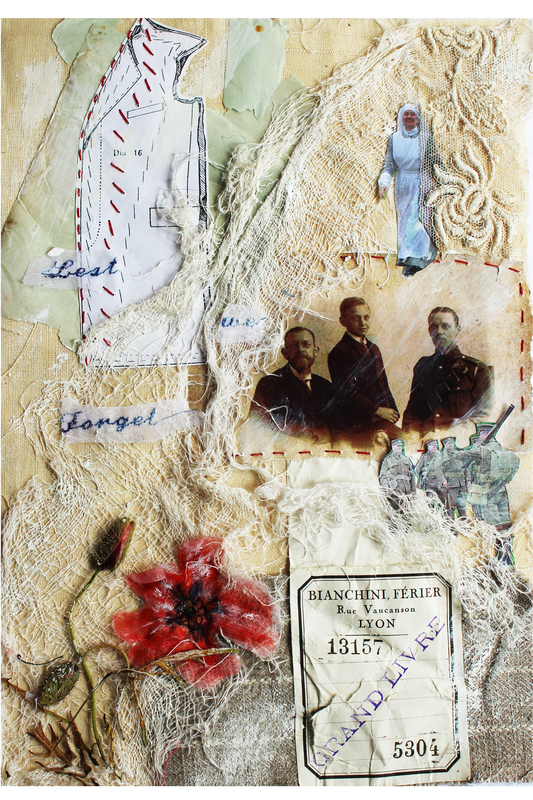 Each individual will create a piece of textile work, each telling a story of their family/history 100 years previously. They may choose to explore the social change, and the change in expectations that they experience compared to one of their ancestors 100 years ago. Vinny, born in Scotland, received a First Class Honours in Printed Textiles at Middlesex University in 2002 and then took a PGCE in Art and Design after a previous career working on worldwide music tours as a wardrobe consultant and as a freelance dress-maker, costume maker and sample machinist. Vinny has exhibited widely since graduating including selling her degree show work to the Donna Karan studio and exhibiting a piece for ‘Art of Stitch’ fashion show at the V&A Museum in 2002. Since graduating she has worked as a textile artist and designer whose experience ranges from art textiles, textile design for the fashion industry. She has also run specialist textile workshops and teaches art and textiles. number of levels for her – her practice of collecting family history, working within communities to develop textile artworks and the referencing of prayer flags. Independently of this commission she has been developing work in remembrance of WW1 inspired by a visit to Wrest Park in Bedfordshire. She is also collaborating with the glass artist Chris Wood to create a major public art commission for Cochester Hospital. Chris, Helen and Effie are all Milton Keynes based dance artists who have been working together in various capacities since 2008, most recently acting as the directorial team for the MOTUS dance festival in Milton Keynes. Between them they have over three decades of experience working in dance and they have many links with the MK community which Westbury Art Centre believes will be a key factor in the success of the GW project. Chris, Helen and Effie have extensive experience of working collaboratively. Chris graduated from De Montfort University with a 1st class honours degree in Performing Arts having specialised in Contemporary Dance and Choreography. He has toured with a multitude of companies both nationally and internationally. Alongside his performance career he has worked as a choreographer and teacher including working with Warwick Arts Centre’s Boys Dancing project for many years and most recently, has established a Milton Keynes based youth dance company, Initiate YDC, that performed its inaugural work at the recent dance festival. Helen completed her degree at the Northern School of Contemporary Dance. She joined Motionhouse in 2000 after touring with Dansconnect, an initiative run by Swindon Dance, and remained with them for six years, becoming a dance captain. Helen has also toured internationally with a Norwegian company, Panta Rei Dansteater, and nationally with Mobius Dance Theatre. During this time she began to direct her own work and has worked as a creative director, most recently as Assistant Choreographer for the Opening Ceremony for the Paralympic Games. She has many links in and around Milton Keynes. Effie began her dance training at Stella Mann College before undertaking a Postgraduate Diploma at the Northern School of Contemporary Dance. Her professional performance experience covers a wide range of companies including Parlor Dance and most recently Ffin Dance. Effie has experience of working with people across the age spectrum from children aged 3 to adults in education settings and in community based groups and she has worked professionally on several large-scale site-specific participatory projects including Games Time Northampton and the recent Under the Vaulted Sky for the 2014 MK International Festival. 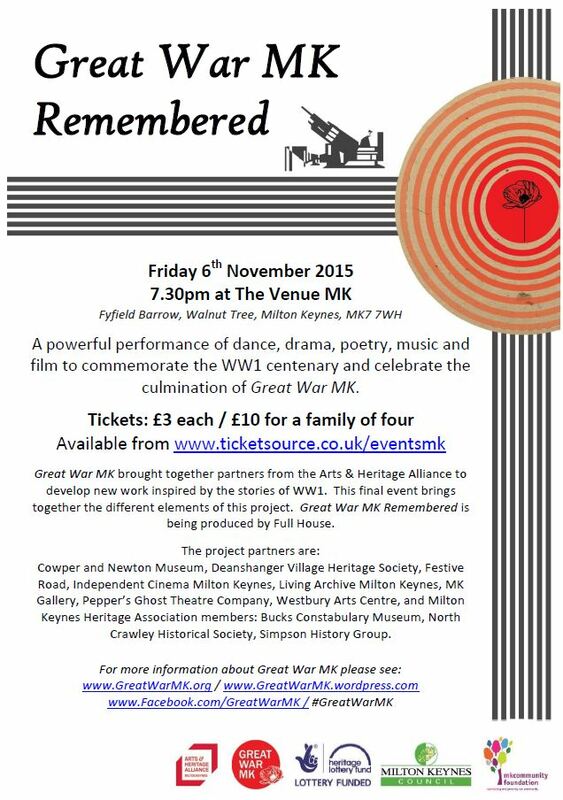 Westbury Arts Centre is very excited to have this opportunity of working with Vinny and the dance/choreography trio of artists over the coming months and look forward to engaging with Milton Keynes community and working with the partners across the Great War MK project.